Once again, Moses sheds fresh light on passages that the viewer thinks they are familiar with, only to realise that thay are more familiar with DeMille than with scripture. 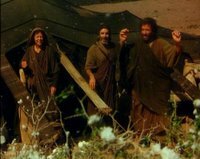 One notable example in this second part of the film is the giving of the Ten Commandments. Whilst there is plenty of interpretation here, this version would appear to be closer to the text. In the Torah, the story is somewhat confusing due to Moses ascending and descending the mountain several times, yet the final verses before God starts speaking the Commandments locate Moses at the bottom of the mountain with the people ("So Moses went down to the people and told them. And God spoke all these words" [Ex 19:25-20:1]). The second part of Moses covers a much wider volume of literature drawing from 4 books (Exodus, Numbers, Deuteronomy and Joshua) whereas part 1 only covered the first thirteen and a half chapters of Exodus. 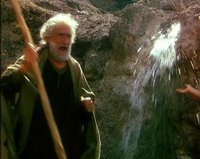 Strangely though, compared to many of the other films about Moses, this one actually devotes a far greater percentage of it's run time to these events. 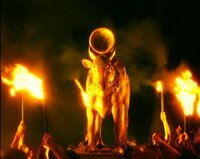 DeMille's 1923 Ten Commandments only covers the period from the Passover to the Golden Calf. His remake lasted for 4 hours, but most of this time was spent fleshing out Moses's youth and his discovery of his Hebrew identity. 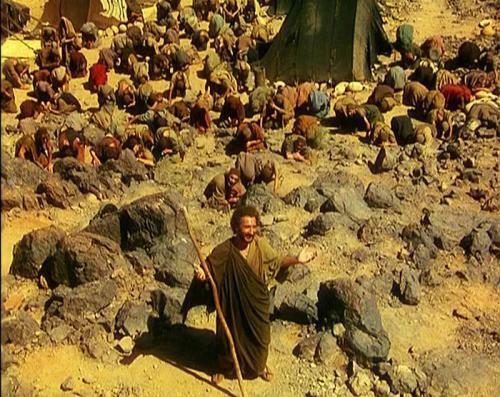 Only the scene where Moses stares out at the Promised Land is added to the episodes after the Red Sea. Moses und Aron (1973), focussed on the tension between knowing God and communicating his will, does not really concern itself with the life of Moses per se, and both Wholly Moses and The Prince of Egypt end with the giving of the Ten Commandments, as do a host of children's cartoon portrayals. That said two other films are concerned with events after the giving of the Ten Commandments. DeBosio's Moses (1975), both in it's cinematically released 3 hour version, and the 6 hour TV series (Moses the Lawgiver) and perhaps this later film could be seen as something of a remake. The other film is the recent TV film The Ten Commandments (2006) (scene guide parts 1 and 2). What is strange is that there is so much comment on the character of Moses, and human nature in general in these four books, yet, until recently, they have been fairly poorly explored. The scenes that the second half includes allows for a much more intimate and honest portrayal of Moses. Whilst not quite as critical of Moses' character as The Ten Commandments, it also portrays his weaknesses, in particular the incidents with Jethro (Ex 18), and the striking of the rock (Num 20). Sadly though his opponents remain as one dimensional as they are in the bible.